The MB EVO PRO torch series represents a totally new concept in welding torch design, form and function. Unique ergonomics, following extensive research, provide a greater sense of control, enabling the welder to feel as “one” with his torch. The trigger position, trigger design and ball joint construction guarantee optimum balance and comfort in all welding positions. Tough working conditions are to be expected when MIG/MAG welding. Despite their lower weight and sophisticated design, the new MB EVO PRO torch line sets new benchmarks for strength and durability. Featuring newly designed, more robust fittings and improved space inside the handle for ease of servicing. Technology for professionals. 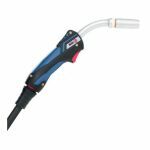 Air cooled MB EVO PRO welding torches feature the reduced weight “BIKOX® LW” cable assembly, for even better handling and scientifically proven reduced operator fatigue, in all welding positions. Improved handling and reduced strain have been shown to have a measurable impact on weld seam quality. Proven “MB” wear parts – for long, economic service life. Genuine two-component handle – robust and ergonomic. Optimum trigger position and tapered handle design – for precise predictable handling. Unique internal geometry for air cooled torches – enabling a cooler grip with maximum mechanical strength. Low weight BIKOX® (LW) – offering weight reduction of up to 34 %.